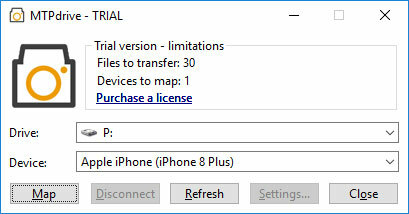 The MTPdrive allows mapping devices operating in MTP mode to a drive letter in the Microsoft Windows. It offers read access to the files on the device with ability to delete them (e.g. digital cameras or Apple devices). Write access is supported as well but it depends on device`s capabilities (typically Android based devices allow it). Productivity and timesaving toolkit: Launcher, Shortcuts, Advanced Calculator, Tweaker, Window Mover, Real Zoom&Real Close.